If This Trailer Had Wings perform for pedestrians on Austin's South Congress Avenue. Austin, Texas (CNN) – Even in the middle of an overcast Tuesday afternoon, South Congress Avenue in Austin is still cluttered with people. People move through the countless shops and spots to eat, including about a dozen food trucks parked along the street. From the picnic tables in front of the trucks, one can hear the haunting folk music from the trio, If This Trailer Had Wings. 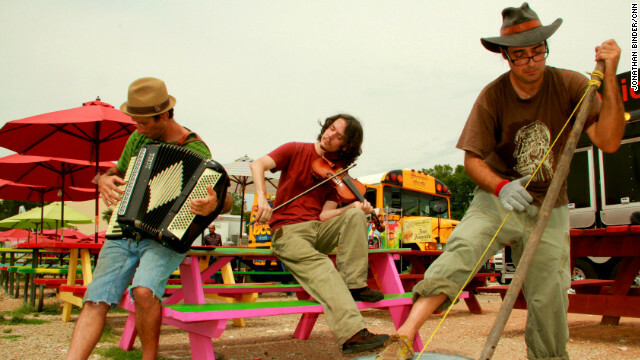 The members include Jacob Marshall on violin, William Michael Landine on the washtub bass, and Zeferino Chrones on accordion. Marshall, Landine and Chrones remain hopeful that things will eventually improve and they can keep doing what they love to make a living. So as the political talk faded, the band picked up their instruments to play once again for the passing crowd. You can see all our Embed America coverage here. And track the team's progress on our Embed America map.